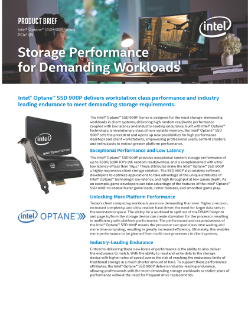 Intel® Optane™ SSD 900P delivers workstation class performance and industry leading endurance to meet demanding storage requirements. The Intel® Optane™ SSD 900P series is designed for the most storage-demanding workloads, delivering high random read/write performance coupled with low latency and industry-leading endurance. Built with Intel® Optane™ technology, a revolutionary class of ...non-volatile memory, the Intel® Optane™ SSD 900P sets the precedent and opens up new possibilities for high performance desktops and workstations, empowering professional users, creators, and enthusiasts to extract greater platform performance. Workstation class performance and low latency. The Intel® Optane™ SSD 900P provides exceptional random storage performance up to 550K/500K IOPs (4K random reads/writes), and is complemented with ultralow latency of less than 10 µs. These attributes make the Intel® Optane™ SSD 900P a highly responsive client storage solution. The SSD 900P also enables software developers to optimize applications to take advantage of the unique attributes of Intel® Optane™ technology low latency, high throughput at low queue depth, and high quality of service (QoS). As an example, game developers can take advantage of the features of the Intel® Optane™ SSD 900P to enable faster game loads, richer features, and smoother game play.